The quantum mechanical model lets us take an atom and make predictions about its properties. All we need to know is how many protons it has (and how many electrons, which is the same as the number of protons for a neutral atom). We can predict the properties of the atom based on our vague idea of where its electrons are and, more importantly, the energy of those electrons. How electrons fill in their positions around an atom is called the Aufbau Process (German: "building-up" process). The Aufbau Process is all about keeping electrons at their lowest possible energy. A corollary of Coulomb's law is that the energy of an electron is affected by attractive and repulsive forces. The closer an electron to the nucleus, the lower its energy. The closer an electron is to another electron, the higher its energy. If an atom has a second electron, it will also be as close as possible to the nucleus. It could have the same quantum numbers as the first electron, except for spin. There is a trade-off, of course, because those two electrons will be close enough to repel each other. However, if it is a choice between that and taking a position much farther from the nucleus, the second electron will go ahead and pair up. These two electrons are sometimes described as being "in the same orbital"; their first three quantum numbers are the same, so that are probably found somewhere in the same region of space. This first orbital, which has no directional restrictions, is called the 1s orbital. Figure AT5.1. The 1s orbital has no directional preference. It can be found in any direction from the nucleus. There is only room for one orbital at this distance from the nucleus. A third electron has to occupy another orbital farther away, the 2s orbital. Again, this is a spherical orbital: the electron can be found in any direction. The 2 in 2s means the principle quantum number is two (corresponding to the second general energy level). The s is a code for other quantum numbers; it means the electron can be found in any direction, just like the 1s electrons. Figure AT5.2. The 2px orbital has a directional preference. It can be found only along one axis. Figure AT5.3. The 2py orbital has a directional preference. It can be found only along one axis. Expressed in a different way, an electron with principle quantum number 2 can have four different combinations of its other quantum numbers. These combinations are denoted 2s, 2px, 2py and 2pz. The three 2p combinations are a little higher in energy than the 2s orbital. Why is the 2p level higher than the 2s level? That's related to the wave behaviour we saw before. With a node in the middle, the 2p orbital behaves as a higher-frequency wave than the 2s orbital. A higher-frequency wave has higher energy. So, a p orbital, with one node, is always higher in energy than an s orbital, with no node. Once again, we have several energy levels available for an electron, but they will surround the atom in a way that lowers energy. A second electron remains in the lower-energy 1s orbital. A third electron will go into the 2s orbital. It's the lowest in energy. What about a fourth? Does it go into the 2s or a 2p? Once again the pairing energy is not quite as big as the energy jump up to the 2p orbital. The fourth electron pairs up in the 2s orbital. A fifth electron goes into one of the 2p orbitals. It doesn't matter which one. We will say it is the px, arbitrarily. A sixth electron again could either pair up in the px, or it could go into the py. But the py level is really the same as the px, just in a different direction. The energy is the same. That means a sixth electron will go into the py rather than pair up in the px, where it would experience extra repulsion. Note that the p orbitals are often drawn a little differently. For example, p orbitals are usually drawn in a way that shows that they have phase. Either the two lobes are coloured differently to show that they are out of phase with each other, or they are shown with one lobe shaded and the other left blank. Figure AT5.4. The 2px orbital shown with phase information. This pattern of "filling" electrons is generally followed for all of the elements. The tally of how many electrons are found in each orbital is called the electron configuration. For example, hydrogen has only one electron. Its ground state configuration (that means, assuming the electron hasn't been excited to another orbital via addition of energy) is 1s1. On the other hand, an atom with six electrons, such as the element carbon, has the configuration 1s22s22px12py1. There is one electron in each of two p orbitals in order to avoid repulsion, which would happen if they were in the same one. You may already know that electron configuration is the reason the periodic table works the way it does. Mendeleev and others noticed certain elements had very similar properties, and that's because they have very similar electron configurations. Lithium has configuration 1s22s1 and its alkali sister, sodium, has configuration 1s22s22px22py22pz23s1 . In both cases, the last electron added is an unpaired s electron. The last electron, or last few electrons, added to an atom generally play a strong role in how the atom behaves. This "frontier" electron is the one at the outer limits of the atom. If the atom is to interact with anything, the frontier electron will encounter the thing first. In contrast, the "core" electrons closer to the nucleus are more protected from the outside. There are some shortcuts we take with electron configurations. We tend to abbreviate "filled shells" (meaning all the possible orbitals with a given principle quantum number are filled with electrons) and filled "sub-shells" (like 2s or 2p). First of all, in the case of p orbitals, if all the p orbitals are filled, we might just write 2p6 instead of 2px22py22pz2, because there is only one way all the orbitals could be filled. However, we wouldn't necessarily write 2p2 instead of 2px12py1, because we may wish to make clear that the configuration does not involve two electrons in one p orbital at that point, as in 2px22py0. Also, we dispense with orbital labels entirely to ignore core electrons in a filled shell. For example, instead of writing 1s22s1 for lithium, we can write [He]2s1. Instead of writing 1s22s22px22py22pz23s1 for sodium, we write [Ne]3s1. The [He] means all the electrons found in a helium atom, which is a noble gas. The [Ne] means all the electrons found in a neon atom. A noble gas is an unreactive element with a filled shell: helium, neon, argon, krypton, xenon or radon. The electrons beyond the noble gas shell are called the valence electrons. Principle quantum number 3 actually allows a third set of orbitals. These are called the d orbitals. The d orbitals are a little like p orbitals, but they are two-dimensional rather than one-dimensional. A d electron, for example, might extend along the x axis and the y axis, but not in between the axes. The d orbitals have five allowed orientations. They can be found along the x and y axes (called dxy), along the x and y axes (called dxz), or along the y and z axes (called dyz). Alternatively, they might be found in between the axes instead, rotated 45 degrees away from one of the other d orbitals. One of these, called the dx2-y2 orbital, is found between the x and y axes. In the same way, you could imagine an orbital between the x and z and between the y and z axes, but that would make six different orientations. Quantum mechanical rules don't allow that. As a result, two of the possible combinations collapse into a mathematical sum, making just one orbital. We call this one the dz2 orbital. If we look at the third row in the periodic table, we see those three sub-shells (the s, then the p, then the d). Again, the 3s sub-shell fills first. With fewer nodes, this orbital is lower in energy than either the 3p or the 3d. The 3d orbital has more nodes than the 3p, so it is even higher in energy than the 3p. In fact, it is even a little higher in energy than the 4s orbital, the first sub-shell of the next shell. So, the 3d orbitals are higher in energy than the 3p orbitals. The 3d level is very similar in energy to the 4s level. For that reason, calcium's last electrons go into a 4s orbital, not a 3d orbital. Calcium behaves much like magnesium as a result. Some subtle variations are encountered across the transition metals. Filling the d orbitals is not as straightforward as the s and p orbitals. For example, in the first row of the transition metals, all but two elements have configurations [Ar]4s23dx. However, chromium has configuration [Ar]4s13d5, and copper has configuration [Ar]4s13d10. Similarly, two elements in the third row of the transition metals do not have the configuration [Xe]6s25dx. Platinum has configuration [Xe]6s15d9, and gold has configuration [Xe]6s15d10. 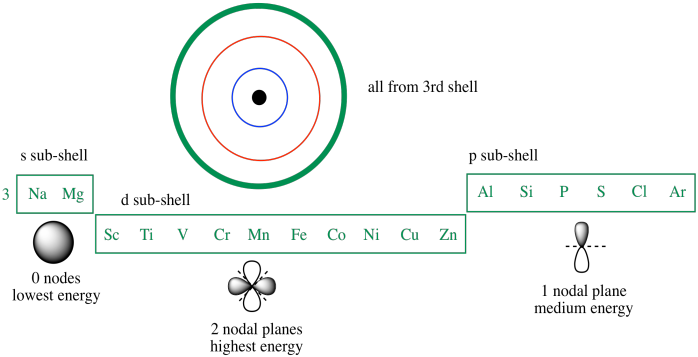 Things are even worse in the second row of transition metals, in which half of the elements do not follow the "correct" order of filling. Niobium is [Kr]5s14d4, molybdenum is [Kr]5s14d5, ruthenium is [Kr]5s14d7, silver is [Kr]5s14d10, and palladium doesn't have any s electrons at all in its outer shell: it is [Kr]4d10. What's going on? The main reason things are complicated here is that the 4s and 3d levels are quite close to each other in energy (as are 5s and 4d, and 6s and 5d). As a result, slight changes are causing the electron configuration to vary from one element to the next. Pairing energy is certainly a culprit; that's the amount of energy it costs to put two electrons in the same orbital. If the electron configuration is [Ar]4s23dx, then two electrons are always being forced to occupy the same space, the 4s orbital. That costs energy, because electrons repel each other. Pairing energy changes from one element to another, but by the time we reach chromium, pairing energy is evidently high enough (or the difference in energy between the 4s and 3d levels is low enough) that the energy is lower if the electrons just spread themsleves out. So, a balance has to be struck between pairing energy and orbital energy. Both are changing as we move from one element to the next. Sometimes the pairing energy of the s orbital is small compared to the energy jump to the d orbital, so two electrons go into an s orbital. Sometimes the pairing energy of the s orbital is large compared to the energy jump to the d orbital, so the electron goes in a d orbital. Of course, the pairing energy of the d orbitals also plays a role in some cases, and it also varies from one element to another. Well, what are you supposed to do with that information? Usually, you are expected to know the most general rule (such as filling like [Ar]4s23dx). Twenty-one out of thirty transition metals have two s electrons and some number of d electrons. Sometimes, you are expected to know the most common exceptions; those are chromium and copper (there's a lot more chromium and copper in the world than there is niobium), and they are relatively easy to remember because one has a half-filled d shell and the other has a completely filled d shell. Most transition metals have two s electrons and some d electrons. Copper and chromium have only one s electron; the other one is "promoted" into a d orbital. You can keep track those two exceptions if you remember that copper has one electron in each d orbital and copper has an electron pair in each d orbital ("half-filled d" and "filled d" is a good rule to remember). One more important thing to know is that these cases describe only the transition metals in their elemental state. They do not apply to compounds, in which the transition metal is found bound with atoms of different types to form salts or other materials. The atoms in a chunk of silver metal have the electronic configuration [Kr]5s14d10, but the atoms in a silver ion, which have one less electron, have configuration [Kr]4d10. The missing electron is lost from the s orbital, not from the d. In general, compounds and ions of the transition metals do not have s electrons in the valence shells. For example, the atoms in pure molybdenum metal may have configuration [Kr]5s14d5, but the molybdenum atoms in compounds, if they still have all their electrons, have configuration [Kr]4d6. Most often, transition metals in ions and compounds have only d electrons in their valence shell. Why would compounds be different? The difference is easiest to see in the case of ions, in which the metal loses one or more electrons. Because it not longer has the same amount of electrons as protons, it becomes positively charged (it has more positive protons than it has negative electrons). The positive charge causes the electrons to become more attracted to the nucleus; that atom contracts or shrinks. Figure AT5.5. A 4s orbital responds to an increase in positive charge when an electron is lost to form a cation. Different orbitals may have different responses to this change in the metal atom. Because the d orbital is one level below the s orbital of similar energy (it is a 3d orbital, for example, compared to a 4s orbital), it is closer to the nucleus. It experiences that positive charge more strongly and contracts more than the s orbital. As a result, its energy is lowered even more than the s orbital's energy by this stronger electrostatic interaction with the nucleus. Figure AT5.6. A 3d orbital responds to an increase in positive charge when an electron is lost to form a cation. 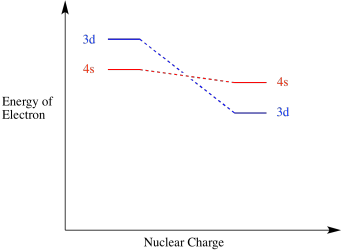 As a result of the charge when a transition metal atom becoms an ion, the 3d level falls below the 4s level. Remember, these two orbitals are very close in energy to begin with, so small changes can reverse their order. Similarly, the 3d level generally falls below the 4s level anytime a transition metal joins other atoms to become part of a compound. The way the 3d electrons fall in energy with increasing charge is one of the factors making the electron configurations of transition metals complicated. In ions and compounds, the d orbital is lower in energy than the s orbital of the next level, not the other way around. Reminder: The filling diagrams for transition metals and transition metal ions/complexes differ. Earlier, we saw that electrons tend to go into unfilled orbitals before pairing up in the same one, provided other orbitals are available at the same energy level. This idea is part of Hund's rule. Hund's rule says, in part, that if you have two electrons, and there are two orbitals available at the same energy level, then one electron will go into each orbital. It's partly about avoiding electron-electron repulsion that would occur if you put two electrons into the same orbital -- that is, into the exact same region of space. It's partly something else though, and that is a quantum mechanical bias toward high multiplicity. Multiplicity refers to the number of unpaired electrons there are in an atom or molecule. By paired, we mean two electrons that have opposite spin. Remember, spin is a fundamental quantum mechanical property of an electron. It can only have two values, and the numerical values seem arbitrary but it's important to know that the two possible options are opposite numbers: they can be either +1/2 or -1/2. Unpaired electrons would be those that don't have a partner somewhere with an opposite spin value. To illustrate that idea, consider the following drawing. It shows three different ways a set of five electrons might fill in a group of five orbital (maybe the 3d level; suppose these are the valence electrons on a vanadium atom). Often, electrons in orbital diagrams are indicated by arrows, with the direction of the arrow indicating the spin. An up arrow means spin = 1/2; a down arrow means spin = -1/2. In two cases, some of the electrons are paired; they have a partner somewhere with opposite spin. The multiplicity is basically a tally of how many unpaired electrons are left over; you get the multiplicity by adding up the spin value of all the electrons. One case has all the electrons unpaired. All of the electrons have the same spin. Multiplicity is maximized in this case. Hund's rule says this case has the lowest energy. What about if two electrons occupy the same orbital? We could still maximize multiplicity by keeping their spins "parallel"; that is, they could both have spin = 1/2 or both spin = -1/2. That doesn't happen, though. Remember the quantum rule that no two electrons on the same atom can be described by the same set of quantum numbers. In other words, each electron on the atom must have a unique identity. This rule has a name, too: the Pauli exclusion principle. Electrons always occupy the lowest energy orbital available. Multiplicity is maximised; electrons are given the same spins when possible. However, when they are found in the same orbital, two electrons must have opposite spin.